"On my honor, I will do my best. To do my duty to God and my country and to obey the Scout Law; To help other people at all times; To keep myself physically strong, mentally awake and morally straight." It is called the Scout oath, and our leaders are tasked with helping the scouts in our pack stay on track. We have developed a fun program that will help the boys in our pack wanting to come back. Every one of our Den Leaders include the parents in meetings to ensure your boy does not feel overwhelmed. 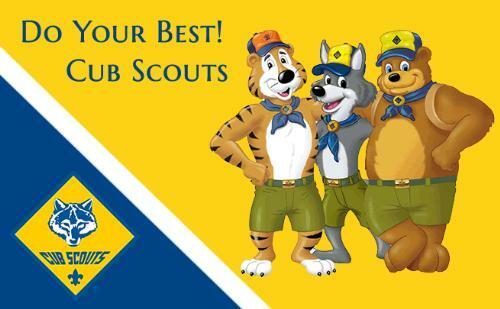 In Cub Scouts, your son must have either a parent or adult partner (approved by parent) attend every meeting with him. Adult Partners must be over the age of 18, and we prefer any attending parent / adult partner be involved during meetings. We do not allow tablets, cell phones or electronic games during our meetings since the boys are easily distracted while they are present. Every month a fun outing is scheduled, and cost is usually low if not free. New and prospective cub scouts are allowed to attend up to two meetings, but can not receive any merit badges or ranks until membership in the BSA is established. We pride ourselves in delivering a fun and challenging program to help prepare cub scouts for advancement to Boy Scouts and for LIFE. If interested in signing your son up or visiting one of our meetings, please click on the CONTACT OUR PACK at the top of the page. Thank you for visiting our site and we look forward to hearing from you. Yours in Scouting -Pack 2862 Admin. ALREADY A MEMBER OF ANOTHER PACK? Already joined another pack, but are interested in visiting with us, No Problem. Cub Scouting does not hold you to a specific Pack, at any time during your scouting experience you can switch, however we encourage you to speak with current pack about you concerns first. Being a parent of a scout is the most important role, and without parents valuable input, Packs can not improve the program or help improve the experience. Not in RVA (Richmond, VA) go to beascout.scouting.org and search for a pack or troop near you.